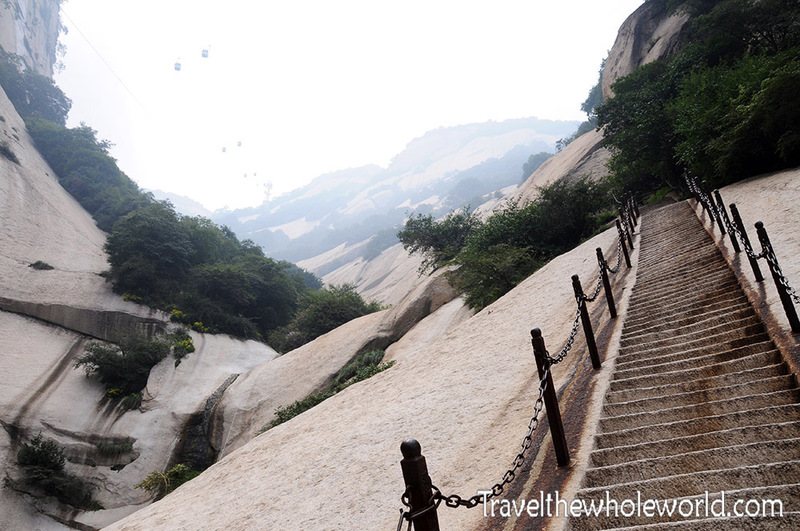 Not too far away from the city of Xi’an is one of the most scenic areas I have ever visited. 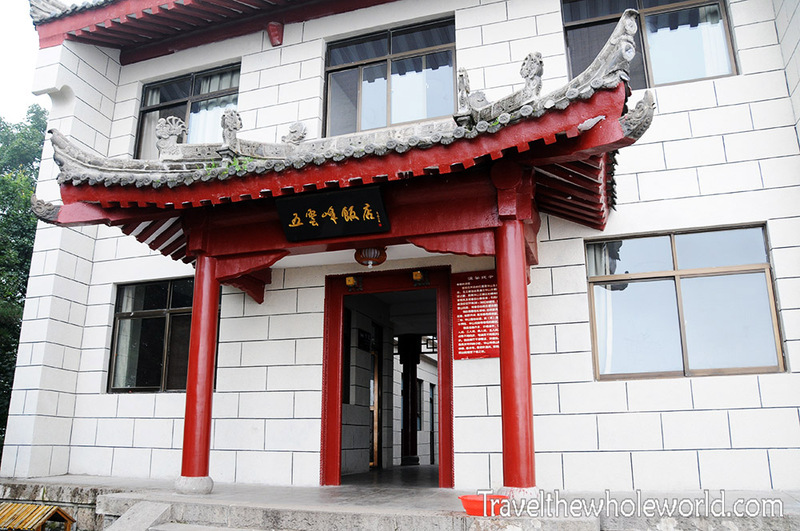 Huashuan National Park is just as easy to reach as the Terra-cotta Warriors. 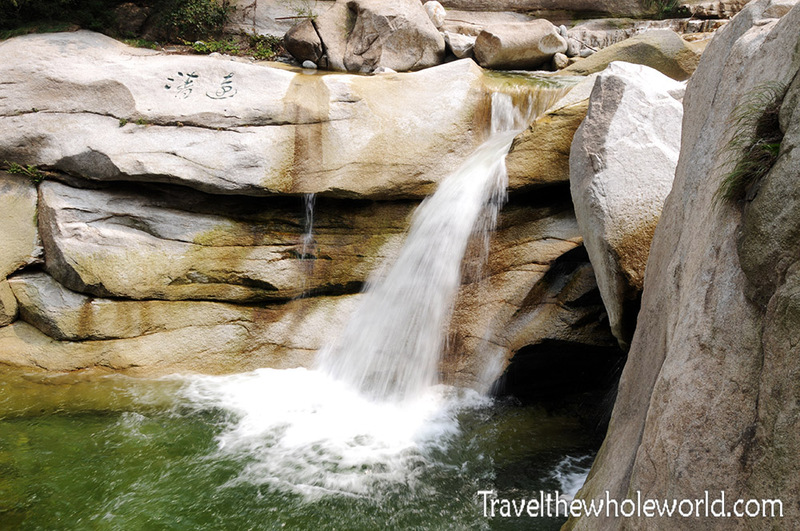 Tall mountains with occasional small trees and shrubs sprouting from the cliffs and occasional waterfalls earned this place a high priority of places to visit in China. Above is one of the first peaks I encountered. Below is one of the several waterfalls I saw cascading into a small pool. There are two options to reach the higher elevations of Mt. Hua. One is the cable car which is probably used by 99 percent of all visitors. The second is the Soldier’s Trail which naturally I choose! I figured I could use a good work out and I hoped I’d have time to stop and reflect on some amazing views along the way. The soldiers trail is essentially the steepest set of stairs that I have ever been on in my life. 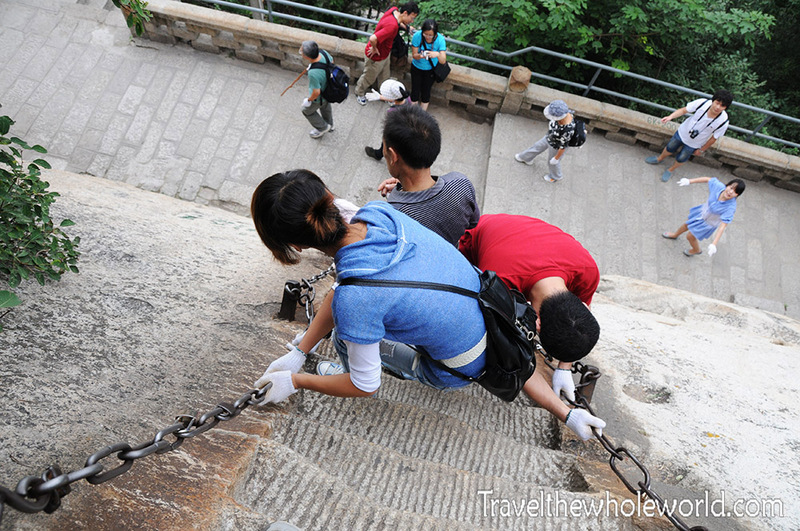 The photo above shows some people descending the stairs as I was just going up. In this photo, you can get another view looking up on how steep the trial is. This guy who was descending seemed a bit regretful of putting himself in that position. His tactic of nearly sitting down while holding on to both handle bars seemed a popular way to descend! 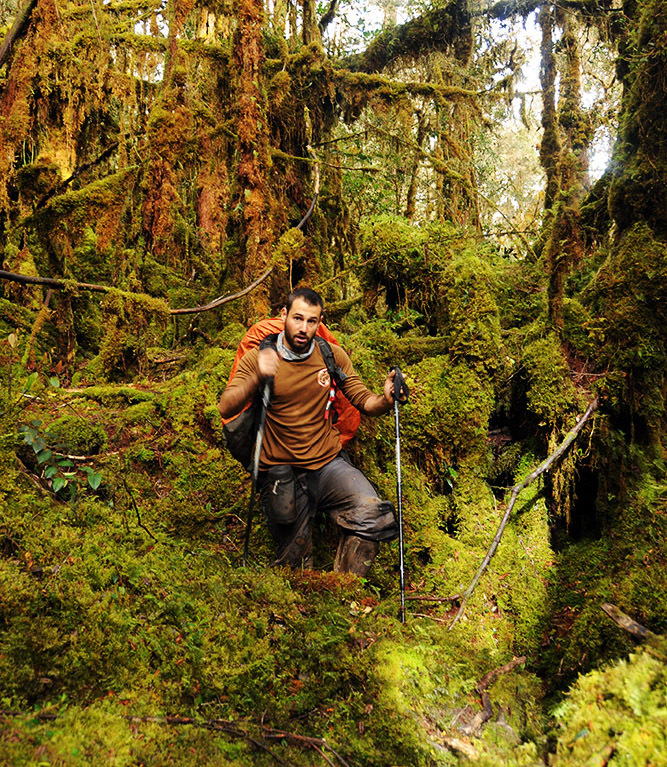 If you hike at a moderate pace it will take several hours to complete the Soldier’s Trail. When I first began there were some people ahead of me but within 20 minutes I either passed them or they had decided to turn around and head back down. The trail didn’t seem to get more dramatic the higher I went. 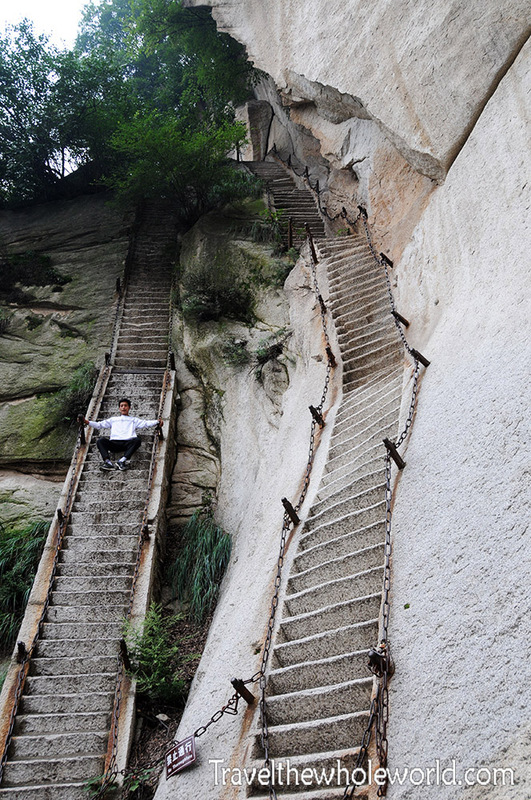 As a matter of fact it seemed worse in the very beginning, where some of these stairs are so steep that a ladder would be a more accurate description. At one point I came around a corner and I was pretty confident I had reached the top. Instead I saw the view above. The cable cars continued their ascent nearly out of sight and at best I was probably only halfway! After another hour or two I found myself at what most people would consider to be the true entrance of the park. There were still plenty of steep stairs from here on out but they were nothing like the Soldier’s Trail. At this point instead of being alone I was surrounded by other tourists with a few shops, restaurants, and even this hotel above. Despite how high I had hiked there were several flat sections at the top of the mountain. 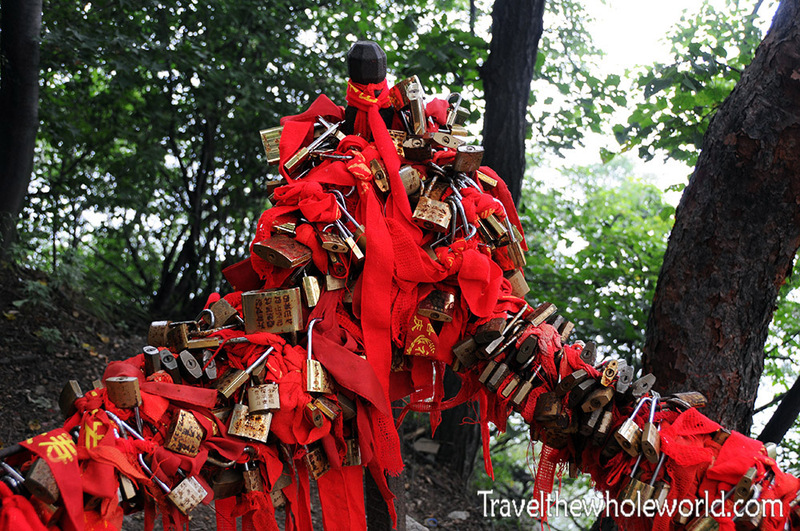 I came across dozens of prayer sites and bridges covered with locks. I believe people make some kind of prayer or wish and seal the banner to the post with a lock. In addition to the prayer sites, I even saw a few cats up here! 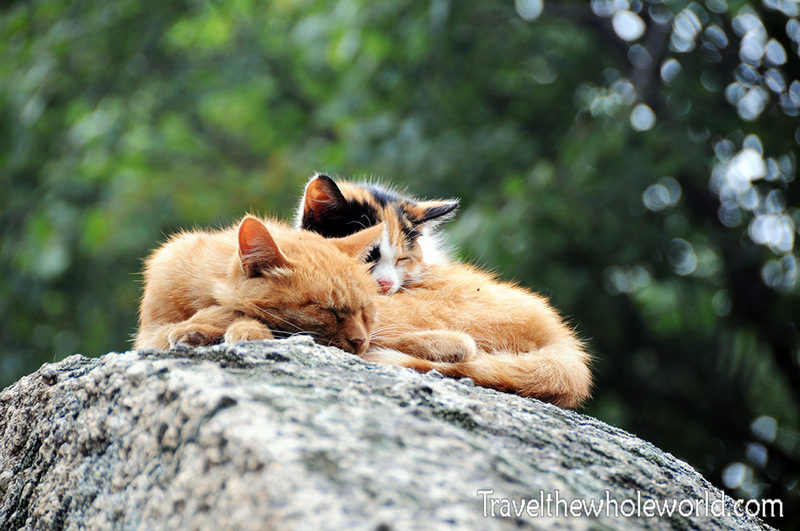 Feral cats or pets? 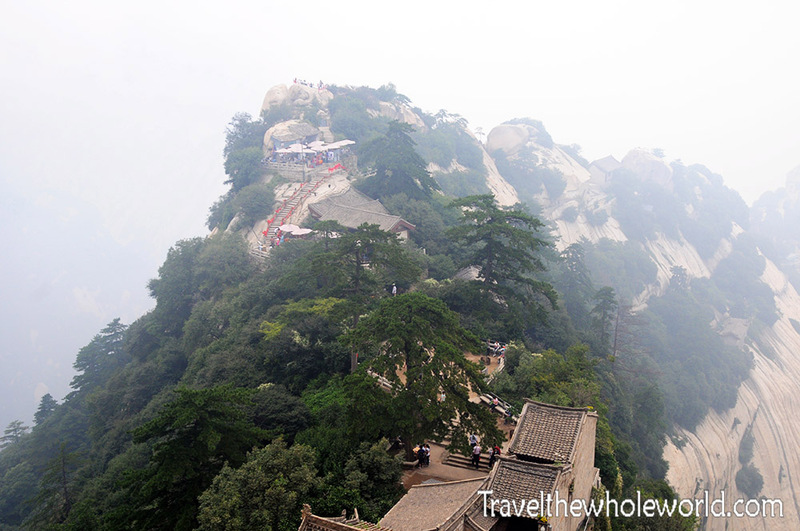 The weather in Huashan when I visited was mostly covered in mist with an overcast sky above. I kind of wanted to clear blue skies so I could see out into the distance, but the mist made the views more dramatic. 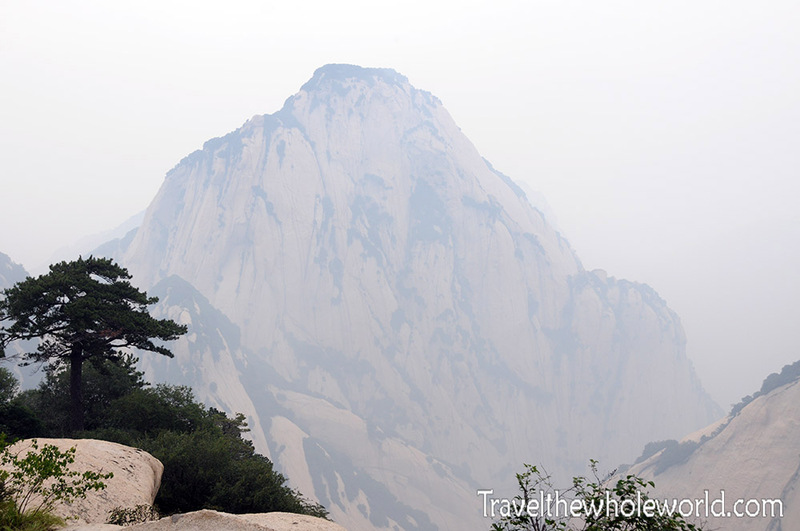 The photo above shows upper areas of Huashan known as Blue Dragon Ridge. 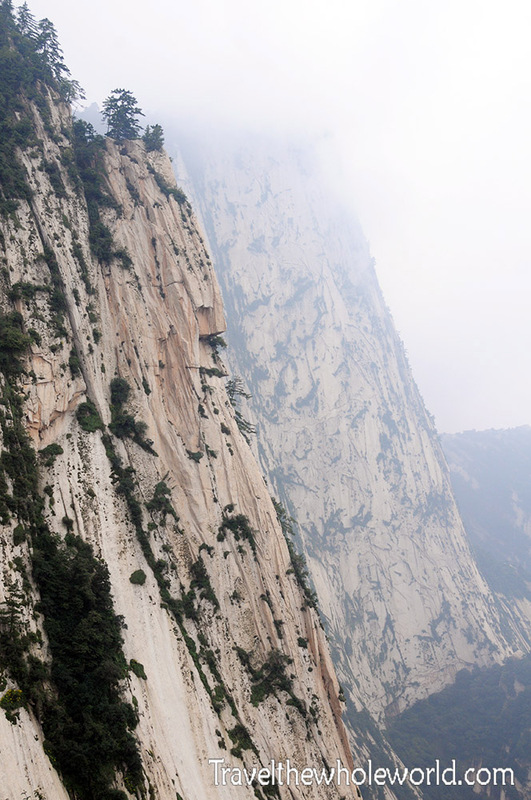 Below you can see some of the sheer cliffs that dramatically drop off over a thousand feet. Unfortunately because of the weather it was difficult for me to tell whether distant objects were mist covered peaks or simply large clouds. 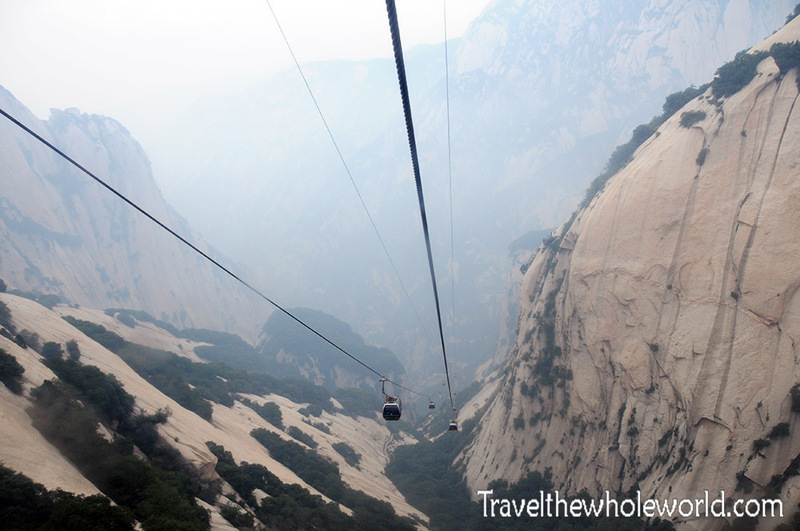 Once beyond the cable cars there is no way to move around other than your own two feet. 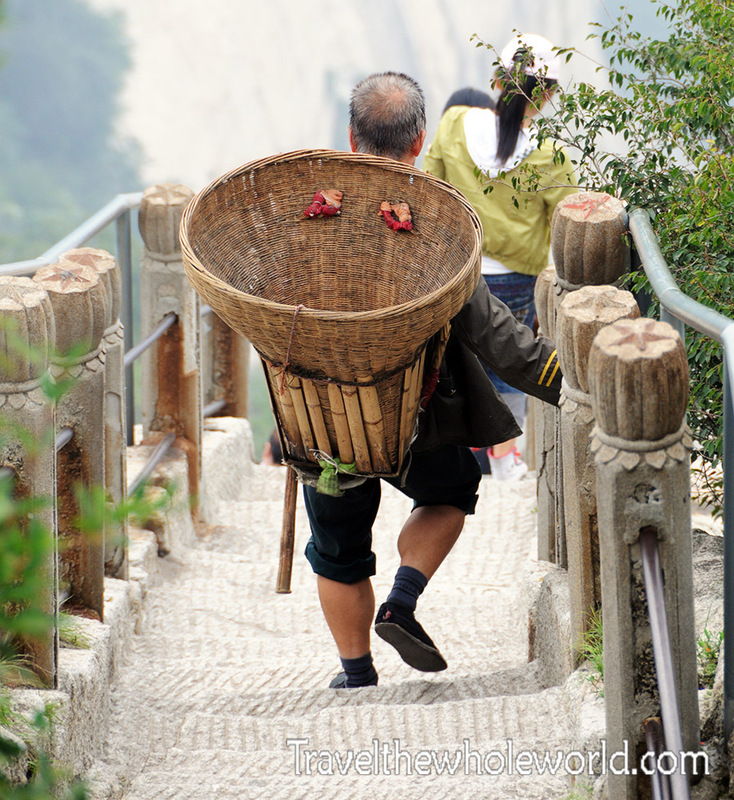 This means all the supplies higher up on the mountain must be carried by people, like this porter with the huge traditional basket tied to his back. On the descent I did opt to take the cable car down. Even though I don’t have a fear of heights I found it pretty intimidating to stare straight down the mountain!